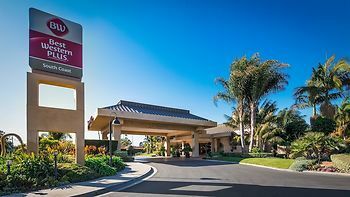 Hotel Best Western Plus South Coast Inn, Goleta, United States of America - Lowest Rate Guaranteed! Easy access for our international guests to our company and the amenities on foot! Beautiful grounds, nice breakfast, decent location, very clean and updated room decor, shuttle to university every 30 minutes. The beds in our room were uncomfortable, but everything else was fine. It would be nice to be able to bring fresh air into the room. The breakfast could have some gluten free bread or rice or quinoa. For me location was very important. I enjoy the clean, beautiful environment of this hotel. I stayed here 3 weeks ago and was back for another visit. I left my phone charger in the room, and when I called the next day, they had it and I was able to get it back. I appreciate the honesty of the workers. I will definitely return to stay here. I love the coffee machine because it makes a great mocha. The room was extremely comfortable and spacious. The breakfast was good. The property was very well maintained and the desk clerk was friendly, professional and very accommodating. Our room was tastefully decorated and the bathroom and shower was fresh and updated.